On 23 March 2016, the City Deal Urban Security was signed. Several public and private organisations joined forces to strengthen the Dutch national security cluster. The City Deal Urban Security aims to achieve a better public-private cooperation that contributes to solving complex urban security challenges. The partners look for forms of cooperation that ultimately result in achievements of both social returns (more security for citizens and businesses /security at a lower cost to society) and economic efficiency (more sales/profit for companies in the security sector and the creation of jobs). The City Deal Urban Security agreement was published in the Staatscourant on 20 September 2016 (in Dutch). The City Deal Urban Security made it possible to start eleven living labs in the partner cities. The goal is to create innovations in the area of urban and digital security. Examples are: event crowd control, safe living for self-reliant citizens and safer traffic. The fast developments in ICT have increased the importance of cyber security. Data environments increasingly depend on information technology. The urban regions and security clusters closely work together to increase digital security and protect critical infrastructures. The Hague Security Delta is a European frontrunner in the field of digital security. The City Deal has already led to unique collaborations in security, innovation and economic development; both on a national and international level. City Deals are an innovative collaboration between cities and urban regions, with a focus on innovative solutions with international potential. 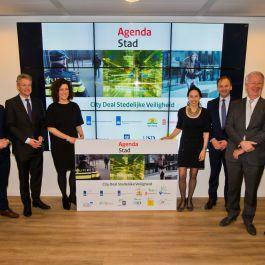 Through closing City Deals the Dutch government aims to strengthen urban regions nationally and internationally. The importance of collaborations between government, businesses and social organisations is a central theme. Various urban regions nationwide are currently exploring City Deals and forming alliances. Currently there are more than 60 city deals in the Netherlands, more information about these city deals can be found here. Partners in the City Deal Urban Security are: HSD Office, Dutch Institute for Technology and Security, Twente Safety and Security, Municipality of The Hague, Ministry of Economical Affairs, Ministry of Security and Justice, Municipality of Zoetermeer, Municipality of Eindhoven, Municipality of Enschede, Municipality of Tilburg, Municipality of Delft, Ministry of Education, Culture and Wellbeing.